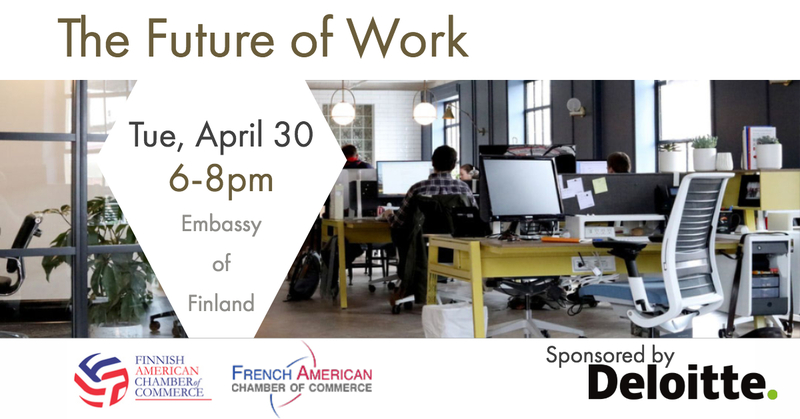 Deloitte, the Finnish-American Chamber of Commerce and the French-American Chamber of Commerce are partnering to bring you the latest insights on one of the most critical issues facing societies around the globe: "The Future of Work". Join us in an interactive discussion on how the private sector and governments are meeting the challenge of the rapid pace of innovation and acceleration of technology that affects every part of our lives. 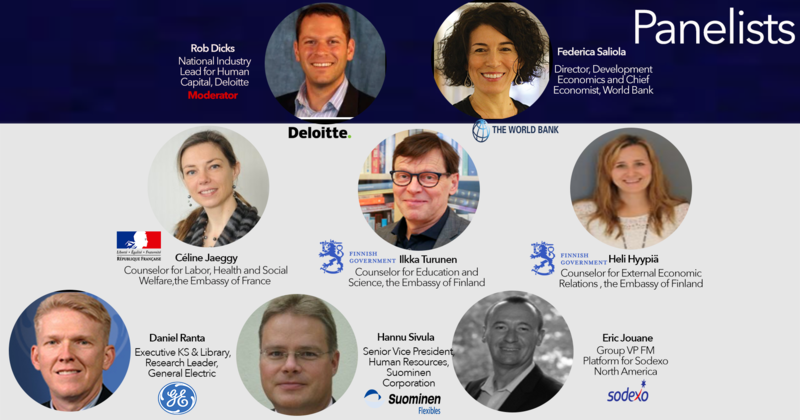 Hear from corporate, diplomatic and international organization experts from Deloitte's Human Capital Practice, General Electric, the World Bank, Finnish and French diplomatic officials. Join us for a Finnish buffet dinner, French wine and networking before and after the discussion. Rob is the National Industry Lead for the Human Capital Financial Services practice of Deloitte Consulting LLP. Rob is also a leader of the Sales Force Effectiveness offering and the Customer Transformation Market offering. He has served Deloitte clients for over a decade with a focus on achieving sales and service effectiveness through customer segmentation programs, building sales roles and responsibilities, and implementing sales model design and territory/account management programs. Federica Saliola, Director, Development Economics and Chief Economist, World Bank, Deputy Director/Co-Author of 2019 World Development Report on "The Changing Nature of Work"
Federica is Director of the World Development Report 2019. Prior to this position, she was a Manager in the Development Economics Global Indicators Group. In that role, she was responsible for developing global programs with a focus on policies and regulations across a number of thematic areas, including agriculture and agribusiness, skills, information and communication technology, public procurement and PPPs. Under her intellectual leadership, nine World Bank global reports have been published since 2014, including the Enabling the Business of Agriculture (2015, 2016, and 2017), Benchmarking Public procurement (2015, 2016, and 2017) and Procuring Infrastructure PPPs (2015, 2017, and 2018). She has published in peer-reviewed journals, including studies on firm productivity, global value chains, and the impact of regulation on growth and competition. She has also contributed to a number of World Bank reports, including the Environment for Women’s Entrepreneurship in the Middle East and North Africa Region; Golden Growth: Restoring the Luster of the European Economic Model; the Jobs Study - Assessing Private Sector Contributions to Job Creation and Poverty Reduction; and the Turkey Investment Climate Assessment: from Crisis to Private Sector Led Growth. She holds a PhD in Economics and a Laurea in Political Science from the University of Rome, la Sapienza. Céline Jaeggy, Counselor for Labor, Health and Social Welfare at the Embassy of France in the United States. Céline Jaeggy is Counselor for Labor, Health and Social Welfare at the Embassy of France in the United States. She worked for local government administrations and held various positions at the French Ministry of Labor, and Ministry of Health and social affairs in Paris. Between 2014 and 2016 she was in charge of Labor Policies at the French Minister of Labor’s office. She graduated from the Institut d'Etudes Politiques of Strasbourg, and the Ecole Nationale d'Administration (ENA). Ilkka Turunen, Counselor for Education and Science, the Embassy of Finland in Washington D.C.
Mr. Ilkka Turunen has over 40 years of experience in education, science and innovation policy. At the moment he is a Counselor for Education and Science at the Embassy of Finland in Washington D.C. He was appointed to Washington from the post of Special Government Advisor to the Ministry of Education and Culture. In that position Ilkka's tasks were forecasting, strategic planning and co-ordinnation of evidence-based decision-making. He served as Secretary-General of the Finnish Research and Innovation Council 2010-2013. Before that he worked at the Department for Higher Education and Science Policy where he was responsible for international cooperation in higher education. Turunen has worked as Counselor in Finland’s embassies in Paris and Brussels. Heli Hyypiä, counselor for External Economic Relations team, the Embassy of Finland in Washington D.C. Counselor Heli Hyypiä works in the External Economic Relations team in the Embassy of Finland in Washington DC. Her portfolio includes energy and climate policy, arctic affairs, transport and agriculture. Previously Ms. Hyypiä served in the permanent representation of Finland to the EU in Brussels from 2013 to 2017. She represented Finland in the EU Council’s General Affairs working group and handled relations with the European Parliament. Ms. Hyypiä joined the Foreign Service in 2012 and before her posting to Brussels worked in the department for development policy, unit for Development Finance and Private Sector Cooperation. Denis Chazelle is the Executive Director of the French-American Chamber of Commerce, Washington, DC Chapter. In that position, he not only promotes the business ties between the France and the U.S., but also helps organizations, individuals and government agencies alike having any type of interest in the French-American relationship, to connect with one another. A native of the Champagne region in France and residing in the United States since his early adulthood, Denis has always had a keen interest in French- American matters, and the deep friendship between the two countries. He is also himself an entrepreneur who has started several businesses, including a computer training company with more than 50 employees and a database consulting firm. He has also ventured in an indoor soccer and multi-sports facility, and an adventure travel company. Having a degree in education, he considers himself a teacher for life. His motto in business as well as in his personal life is “there is no traffic jam on the extra mile”. 25+ year background in creating and implementing strategies. Designed the KM strategy at ConocoPhillips and implemented a program that went from last in the industry to the industry leader. Worked closely with the business to document and validate $100s millions in business value. Facilitated more than 75 strategic visioning sessions with a unique methodology that helped turn strategy into action. Helped change several areas of this company with other transformational approaches. Sought out as an external speaker based on over 2 decades of consulting success. Human Resources generalist in international / global environment, chemicals and engineeringindustry. Specialties: Business oriented HR development, restructuring and re-organisation (inclunion negotiations), employee engagement, HR metrics, recruitment, Comp & Ben. Eric Jouane is Group VP FM Platform for Sodexo North America and based in Gaithersburg (Maryland, USA). FM Platform in North America covers, Hard FM, Energy Services, Cleaning, Grounds & Security in Soft Services, Construction Services, FM Service Development, Sodexo|Roth affiliate located in Youngstown, Ohio. Eric holds an Executive MBA from HEC Paris, a Bachelors’ degree in mechanical engineering and is graduated from Toulon Kedge Business School. He started his career at Esaco International, one of the leaders and most experienced companies in building and equipping clinics and hospitals in Africa under international financing. As a VP Sales & Ops for Africa and Middle East, Eric managed projects from design to construction accomplishment. After 5 years (in 1998), Eric decided to make a move in his career by joining Sodexo Energy & Resources (E&R) segment as Supervisor of the Shell Gabon contract. He was then appointed Country CEO for Sodexo Algeria, one of the largest subsidiaries of Sodexo E&R. After 2 years, Tunisia was added to his area of responsibility. In 2002, he went back to France as Global Account Director, in charge of large accounts Agip, Total, and Bechtel. He also started our activities and was Country CEO for Iceland. Eric then wished to go back to a more operational role in the field and in 2006, was appointed Country CEO for Sodexo Oman (5,000 employees). In 2012, Eric joined “Invent 2020” project team. The objective was to build-up a new operational, managerial and organizational model for Sodexo Group. Eric led Segment workstream, interaction with Segment CEOs, built-up first versions of consolidated Design Model Book and End-to-End operational processes. End of 2015, Eric took the leadership of North America FM Platform in Service Operations. - Finnish-American Chamber of Commerce, click here. - French-American Chamber of Commerce, click here.